I have four kids (ages 9,6,4, and 1). I spend most of my life utterly exhausted and in somewhat of a manic state. You can read more about how I stay sane here. I have a lot of fun and we make a lot of great memories, but some days are just plain terrible or not as good as others. Most are just regular, with a mix of crazy and a mix of awesome. I am a generally positive person, so overall every day is great... or at least has several good moments! My favorite mantra to repeat is "Every day may not be good, but there's something good in every day (Alice Morse Earl)." If you've followed along for awhile, then you've probably read my post My Perfect Schedule for 2-Year-Olds. It was written two years ago and it was one of my favorite time periods before my newest little one (baby #4) arrived! Nowadays our schedule looks a bit different, with occasional glimpses of that perfect schedule. With two kids in elementary school, one in preschool a few days a week, and one at home with me all day, things are busier. I am looking forward to returning to that perfect schedule (or a new version of it), once my preschooler is in elementary school. As I mentioned in my previous schedule post, sometimes our days look completely different when we have playgroups, playdates, toddler classes, or when we are planning events. In this post I am just sharing our general schedule. I'd love to hear yours! I love getting inspiration from other people. I know there are a whole bunch of people out there that are doing life much more productively than I am! I am a slave to the clock so unfortunately we have a lot less flexibility than we used to and I don't have the ability to not have a schedule these days! I kind of miss the days when we could not have a plan and do whatever we want. That is why I am so excited for summer and our summer adventure list. 7:30am Sleep until absolutely the latest possible and let the big kids feed the little kids. Usually it is 7am... but I try and stay in bed as long as possible. Sometimes I can make it till 7:45 and then usually there is some sort of brawl that I have to interrupt. We've talked about this before, but I am not one of those people that wakes up early before my kids. We don't do a fancy breakfast on weekdays. We have cereal most days or frozen waffles and then we race to get dressed before my oldest heads to school around 8am. I am a night owl and work at night... so mornings are always a little bit rough. Someday I am hoping they won't be. I love it when I wake up and work out before the kids get up. I am not in that season right now! I am just too tired! 8:10am Playtime and get ready for the day! This is when I attempt to squeeze a shower in while my 6-year-old plays with the toddler. I am an expert at speed showering. I usually spend about an hour in the car this time of morning dropping off at preschool and kindergarten since neither have a carpool line and I walk the kids up to the classroom door. My toddler loves saying hi to all of the teachers and wandering around the playgrounds. She loves to sneak into the classrooms too! She thinks it should be her turn to go to preschool already! This is a great time to practice skills with her like waving, saying "hi," giving high fives, and blowing kisses! 10:00am Toddler playtime, laundry, cleaning the kitchen... and sometimes the toddler takes a super short nap. This hour of the morning is my FAVORITE time to fit in toddler activities because it is just me and my 16 month old and I can give her all of my attention. Sometimes these activities are just for fun and sometimes I take photos of them to put on the blog or use for sponsored campaigns. Sometimes we use this time to do several activities, especially when I am planning curriculum for our Virtual Book Club for Kids Summer Camp and I am making printable instructions. Often there is no time to do anything except run a load of laundry, fold it, and put it away. My toddler loves to jump in my laundry piles and make big messes. She also loves to follow me around to the other big kid's rooms and destroy their LEGO creations. ;) If I am not doing laundry, we sometimes tackle another home organization project OR we go running and I push my little one in the jogger. 11:15am Pick ups start again and I have another hour in the car! My toddler is pretty patient in the car. She hates my music, so I do a lot of "what does the cow say?... moo!" sort of things while we drive. She loves animal sounds! I also just chat at her. I also always bring a few books and some snacks for while we are running around so she has something to do. She mostly likes to throw the books out of her carseat, but sometimes I catch her looking at them. 1:00pm Lunch for my three littlest kids and naptime for my toddler. During naptime I get house stuff done and my preschooler and kindergartener have quiet time. Sometimes they watch a show if I have deadlines and need to get work done (for the blog) and I need some un-interrupted peace and quiet. 2:30/3:00pm Homework time, snack time, and playtime. This time of day can be crazy once all four kids are home. During this time of day I will often try and put together an open-ended art or science activity that ALL of my kids can participate in! Open ended process art and science activities are great connecting activities, especially at the end of a busy day. 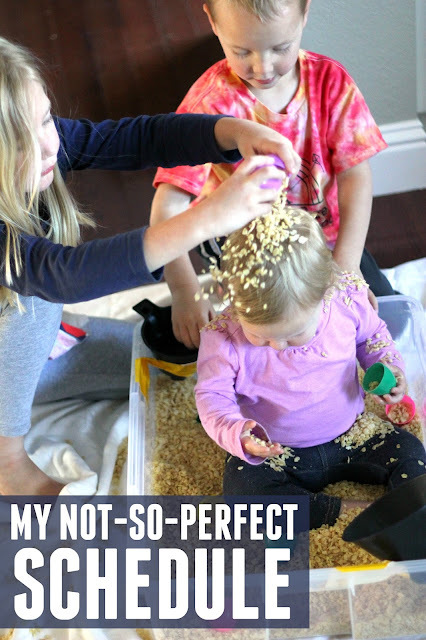 When my two biggest kids are doing their homework then I will sometimes pull out simple sensory activities for my toddler and preschooler for their "homework." 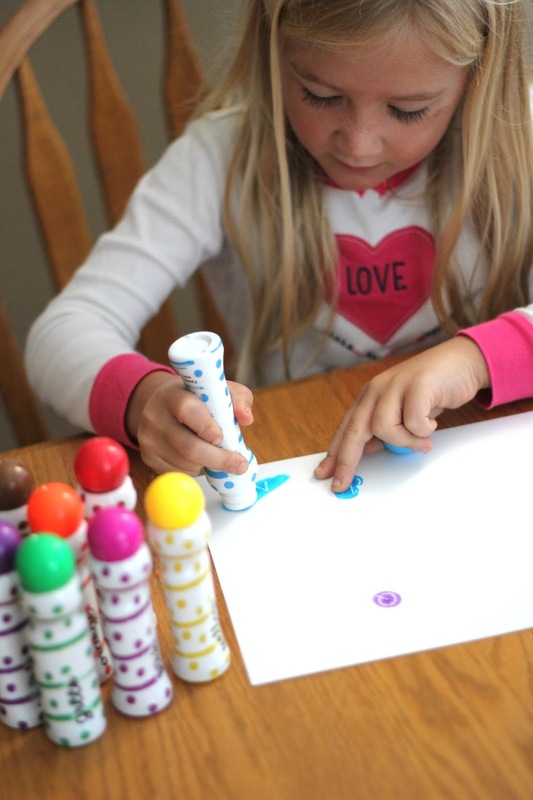 'They also love using stamps and dot markers to make colors on easel paper or paper scraps. Sometimes I send my preschooler off to play his favorite apps (like ABC Mouse, Reading Eggs, or Monkey Preschool) while I give some attention to the kids doing homework. 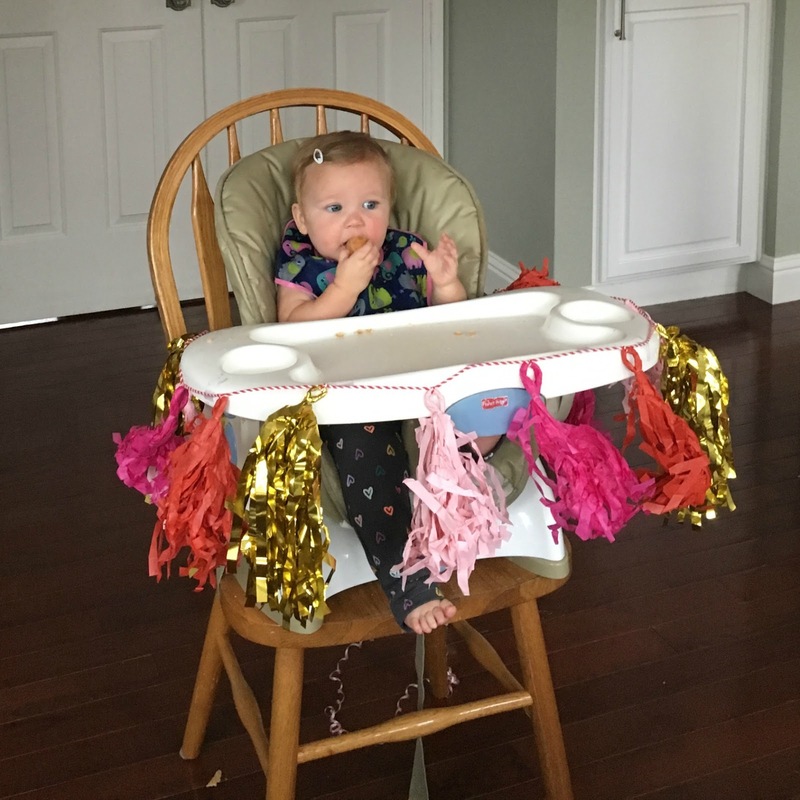 Usually the toddler gets to hang out in her high chair eating snacks and making a giant mess! I love it when we can fit a park trip in before dinner or head outside to ride bikes before it gets dark! My toddler loves using her favorite ride-on and push toys to roam our cul-de-sac and get some energy out. During dinner prep, the big kids play in the backyard or just roam the house. Often they make giant messes at our kitchen table with markers, stickers, paper, and glue. My toddler likes to roam the kitchen and pull things out of cupboards and drawers. I will sometimes pull out a few independent activities for her while I prep dinner. This lid drop activity is one of her favorites. If everyone is totally crazy then I put on a Netflix show for the big kids and I'll let the toddler watch old Baby Einstein episodes on YouTube on my computer. She loves them! I am not a fancy chef. We have really basic simple dinners to keep things easy. Dinner prep usually takes less than 30 minutes unless I've put something in the crockpot that morning. Like I said... super easy. If I am going to make more time consuming meals, I make them on Sundays. During the week there just isn't time. Sometimes my husband makes it home for dinner and it is extra exciting. 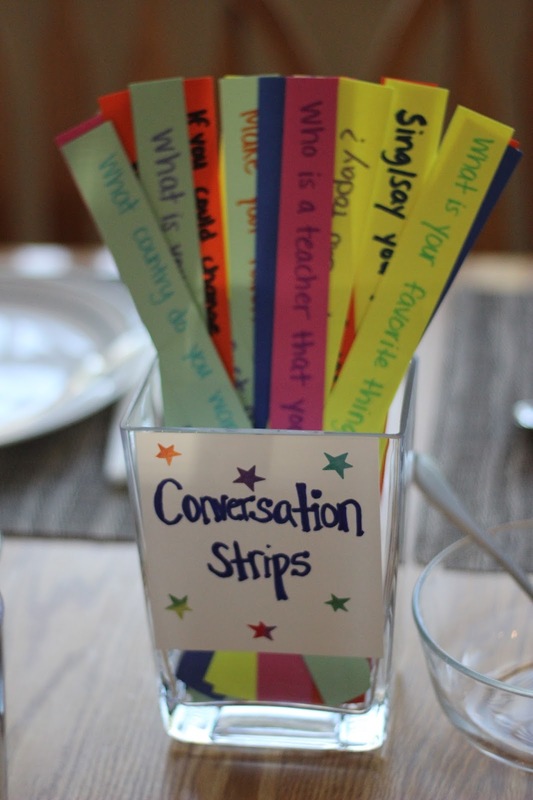 We love to use our conversation strips to make dinner more interesting. The toddler doesn't participate too much at the moment, but we try and involve her anyway! Her favorite is when we make our favorite animal sounds. Often in the evenings I am running kids to piano, cub scouts, sports classes or practices as well! I love when we are off season and don't have to worry about those! 6:30pm Clean up, books, and baths! We attempt to clean up the house after dinner most nights. My toddler loves listening to me sing the clean up song while she helps me put the toys away in her room. Taking time to read books together after dinner is another one of my favorite things. Sometimes I will even read books to the kids during dinner! Some nights there isn't time for anything, but it is awesome when it happens! 7:15pm Get ready for bed! I don't know about your house, but at our house getting ready for bed takes forever. We start at 7:15 (sometimes earlier), so that I will have everyone in their rooms on the way to dreamland by 8pm. It is rare that that actually happens lately... but when it does, it is dreamy. We brush teeth, get dressed, read scriptures together as a family each night and say prayers. My two big kids participate more than the littler ones, but my toddler roams around and loves to sit on my lap while we read scriptures. She usually hits the sack around 7:45/8:00pm lately and then I head off to my other kid's rooms to do my favorite bedtime tradition. With his travel schedule lately, my husband is only home a few nights a week, so things always move a lot more slowly when he is gone! I like to tell my kids that mom is off-duty after 8pm. That is my time to catch up on emails, finish cleaning the kitchen, watch a TV show if I want, and usually get blog work done. Most of my work happens between 8pm-1am. Often the kids bug me until 9pm asking for drinks, extra tuck-ins, etc. Lately my husband and I have been doing a workout video between 8:30-9:30pm while we wait for everyone to settle down. It is much less frustrating to me to stop a workout video than interrupt work emails or projects. Then... we start the schedule all over again the next day... always with the goal that I will wake up earlier or get to bed later or play with the kids more or be more organized... it is a constant work in progress! Somedays we just park it in front of the TV with a treat and call it a movie day. If I am under-slept or kids are sick then I have no problem grabbing blankets and cuddling while watching Moana on repeat. Some day in the future I won't be getting up eight times during the night to cuddle teething toddlers, give extra kisses and put sheets back on the bed, or help someone locate a missing stuffed doggie. When that time comes, hopefully I'll be more productive and organized! I can dream, right? Now that I've shared my schedule, I'd love to hear yours! Is yours similar? Totally different? Make sure you let me know your kids/ages and stages too! Schedules don't have to be perfect, to be awesome... at least that is how I feel about mine. Also, here are five of my favorite things to do every day with my toddler to check out. These are simple ideas to squeeze into any schedule.